Visitors, who can 'chat', purchase at much higher rates than those who don’t. Sales suffer when consumers have doubts or lack the information they need to complete a purchase. Our live chat software will allow potential customers to interact with you directly allowing you to assist them with any questions they may have. While most companies charge for this service, we provide it to you FREE OF CHARGE through our partner ChatStat. And most importantly, boost sales. Live Chat - The ability to conduct live chat with both website visitors and any of the supported IM clients (AOL, ICQ, Yahoo, MSN, GoogleTalk, and Skype) using a familiar instant messenger interface. ChatStat comes with completely unlimited, 128-bit SSL secured live chat. 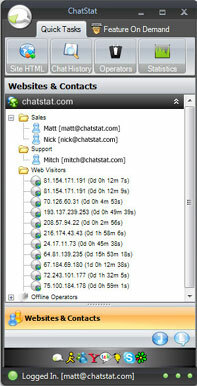 Direct Support for all Major Instant Messenger Clients - ChatStat supports AIM, ICQ, YAHOO, MSN, GoogleTalk, and Skype. Because ChatStat directly supports all of these major instant messenger mediums, it means that you do not have to have multiple IM clients open at once. By using ChatStat to connect with all of your accounts and your website visitors at the same time, only one program is needed. Proactive Client Side Chat Window - If you wish to initiate a chat with a user that is browsing your website, all you must do is double click on their IP address from the main ChatStat IM Control Panel. This will launch a window on the visitor’s browser that instantly opens and ask them if they wish to receive help while they shop or browse your site. If they accept, an instant messenger like chat window opens on both sides and you can chat live with that person. You can also transfer them, direct them, see the page they are on, and you can also view all previous conversations you have had with them. ChatStat is a Pop-Up stopper compliant proactive chat system. What this means is that you do not see any annoying pop up alerts on the web visitor side. Switch Application View Mode - ChatStat has 2 built-in View Modes. The standard (default) view mode is our IM View. This is a small footprint view mode that looks similar to other messenger clients like AIM and Yahoo. If you want more advanced information and view options, toggle into our Grid View mode simply by pressing the F8 key. Grid view is deisgned for full-screen viewing and gives you advanced options and information about your visitors. Online Availability Control - This feature set allows you to quickly change from being available to not being available by a simple toggle button located on the main ChatStat IM Control Panel. Operator Transfer - This feature allows you to transfer any live chat from one operator to the next simply by clicking on the transfer icon and choosing to whom you wish to transfer. This novel but simple approach is superior to the current 3 or 4 step process other programs use to achieve the same thing, a simple transfer. Push Link - If you type a URL into any area of the software it will automatically translate it for broadcast to an end user and open it for them. Using this system you can easily guide your customer to the product they may be asking about. As always, the customer may accept or decline the offer. Operator to Operator Chat - This feature allows you to open live chat sessions with other operators. Canned Responses - Create pre-made responses to things you type all of the time. When you need it, just hit the shortcut key to paste the info. Customer Downloadable Chat Transcripts - Customers may download and/or print a transcript of any conversation at the end. Chat Buttons on Secure Pages - Our software fully supports 128-bit SSL encryptions at all times. This ensures that all conversations are private, and stay private. Furthermore, our chat icon can be placed in secured environments such as the check out area of a shopping cart, without causing an alert or error. Text File Log Sets of Every Conversation - As conversations occur during the normal course of using live chat, our software can optionally record these to text files, neatly sorted in directories by IP or handle. IP Filtering - Enter IPs to filter out of your list in the Grid View mode.